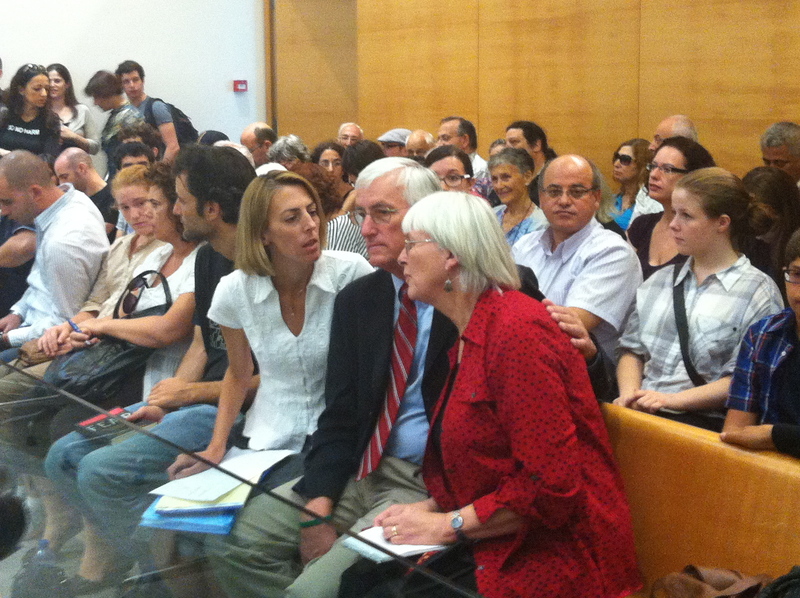 Haifa – Haifa District Court judge, Oded Gershon, ruled today in the case of Rachel Corrie, an American citizen and human rights activist, who was crushed to death in 2003 by a IDF bulldozer while she was trying to protect a Gazan family’s home. Judge Gershon dismissed the civil lawsuit brought by Corrie’s parents and has ruled her death an “accident”. In his ruling, Gershon declared that the International Solidarity Movement (ISM), although it is calling for nonviolent actions, is using human rights and morals to cover its actual actions, which are violent and is using its activists as human shields to protect terrorists! Furthermore, the ruling described the actions of the army during the event as dependant on security needs and that Rachel Corrie entered the area where she knew there were military actions. Gershon decided that by doing this they put themselves in the path of danger and that they are, in effect, responsible for endangering themselves. The HRA believes that the army did not, and does not, take sufficient precautions to protect civilians, Rachel Corrie specifically. This condition, of Israeli institutions taking extreme measures to protect the army’ reputation over the safety of civilians, is reprehensible and is an affront to internationally acknowledged human rights. Nazareth – Last month the Israeli Ministry for Agriculture proposed an expensive new way to discriminate against the Palestinian Arab minority of Israel. The NIS 300 million project would enforce a relocation of the remaining 26 Israeli pig farms from their current locations in the Galilee to the less populous Naqab region in the south. Eating pork is not permitted in Judaism or Islam, so the market for pig products in Israel has always been small relative to other meats. The few pig farms that do exist are owned, operated, and serviced predominantly by the Christian Arabs in Israel; though the secular Jews and Russian immigrants also buy pork. 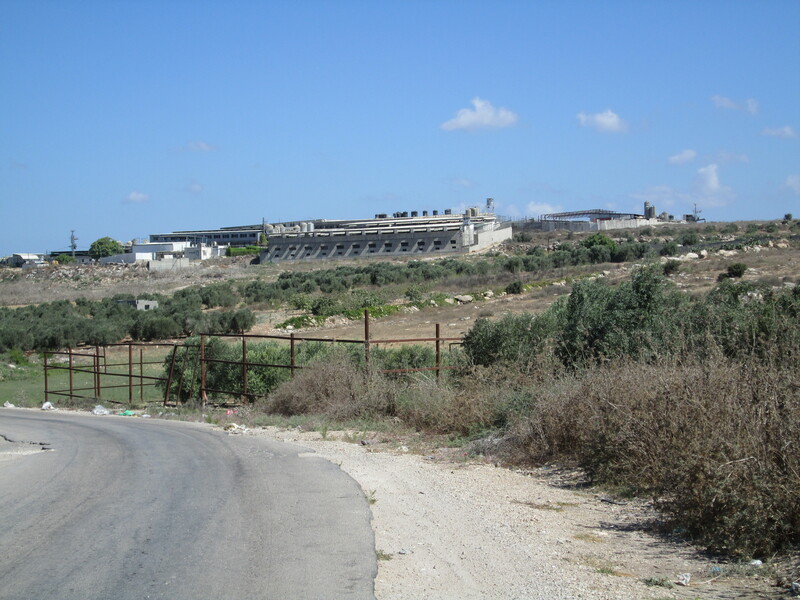 Some of the pig farms in question have been owned by these same Christian Arab families since the foundation of the state of Israel. Now, if the Ministry of Agriculture gets its way, they will have to move. The consequences of this proposed plan would be legion. Business practices honed over generations would have to be altered – practically guaranteeing a rise in pork prices at the very least – but the plan would have much more profound effects as well. It would violate the farm owners’ universally recognized human right to free choice of employment. More generally, it illustrates the inherently discriminatory effects of codifying a religion in state institutions. In an interview with 60 Minutes in April 2012, Ari Shavit declared, “I think this is a land that has seen in the last century a terrible struggle between political Judaism and political Islam in different variations. The Christians are being squeezed in the middle between the Jews and the Muslims…. Political Judaism and political Islam are rocky, they are harsh, and the friction, the clash between them is very violent.” Mr. Shavit was not specifically referencing the struggle of Arab Christian pig farmers, but the issue of pork is certainly a part of the broader struggle for the Arab Palestinian minority living in Israel’s “Jewish and Democratic” state. The Ministry of Agriculture’s plan was made under the guise of “pollution reduction on residential areas” and it uses the European Union’s directive on the domestication of pigs as legal justification and precedent for that allegation. The directives therein are all encompassing. 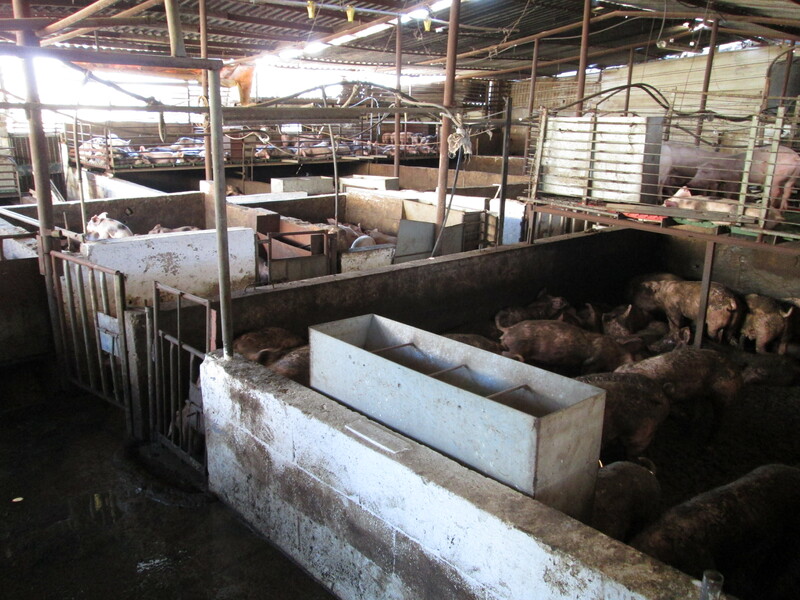 It may be true that the pig farms of Ibilin, Kafr Yasif, and Mi’ilya are all “crowded and unsanitary”. Slate’s Jeffrey Roskowitz personally attests to that fact in a fine article on Israel’s pork industry, but this is not grounds for the removal of citizens’ livelihoods. If anything, it is an opportunity to subsidize an industry for which there is small yet stable demand and demonstrate a respect for diversity. I traveled to Ibillin to see one of these pig farms for myself and to better understand their effect on the community. If the Ministry of Agriculture is to be believed, the proximity of these pig farms puts unnecessary stress on residential areas. The pig farm itself looks more like a factory, but its only visible if you take its specific turnoff on the highway to Haifa. From outside the high cement walls, the vile smells border on noxious and pigs clearly in pain can be heard howling. Dr. Barghout is a veterinarian who works at the farm complex. He was happy to talk to me about the farms and explained that there were many separate farms sharing the same walls, and that “the oldest is 60 years old.” It is an intricate web of interconnected farms that have organized themselves over the course of decades to best fit this space. The Ministry of Agriculture’s proposal would decimate an already small pork industry. 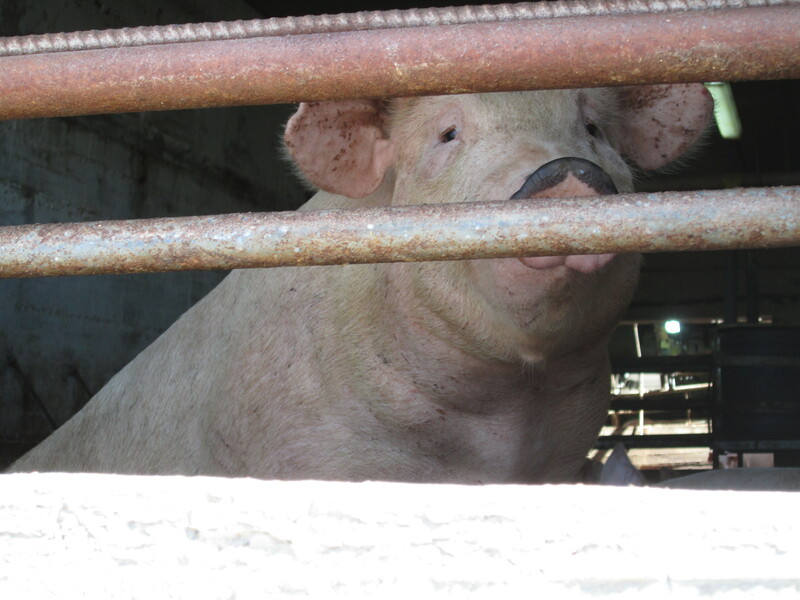 Twenty-six pig farms may seem like a small price to pay for a reduction in air pollution, but not when their relocation represents a violation of the owners’ human rights. The expensive relocation plan is still just a proposal, The Ministry of the Interior is responsible for initiating it. Interior Minister Eliyahu Yishai, who also happens to be the leader of the Orthodox Shas party, is currently reviewing the proposal and a series of joint recommendations from the Ministries of Agriculture and Environment for increasing the standards for pig farms. Minister Yishai is in a difficult position. He is being forced to regulate the husbandry of the single most non-kosher animal. This is the same man who filmed himself ripping up a Bible. How can he possibly make a responsible and unbiased decision on this issue? The domain of pork and pig farming has also been a battleground for strife between the secular and religious communities in Israel since its founding. In 1990, butchers in Jerusalem handed out free ham sandwiches when the government balked to the Orthodox Jewish community’s desire to ban the sale of all pork products. In 2010, Dr. Eli Landau self-published the first Hebrew language pork cookbook. His “The White Book” sparked a minor controversy, but largely remained a product for the niche, secular audience in Tel Aviv. When the New York Times profiled Landau in September of 2012, “The White Book” had sold only 1,200 of the 2,000 copies that he had printed. By Landau’s own estimation, this was less than successful for a cookbook catering to a specific audience. Pork’s limited demand, even among secularists, suggests that its production is fragile in Israel. Arab Christians are put disproportionately at risk when this sector is recklessly cut because it is their ability to provide for their family at stake, rather than a simple limitation on their choice of protein for dinner. There are other interesting ways the government is regulating the way people in Israel deal with pork too. By day, Sameer Absawi is a pharmacist in Nazareth. By night, he hunts wild boar. Some men like Sameer have taken to hunting the apparently thriving wild pigs at night to fill that unmet demand for pork. Sameer does not sell the pork from his successful hunting trips, but he gives it as gifts to his appreciative family. “The wild boar harass the people, they harass the agriculture, so the government gave us a license to hunt the pig.” When I spoke with him, Sameer was upset because the government has stopped licensing new hunters. Hunting wild boar was once a popular hobby among Arab Christians, but the government restrictions are forcing its extinction. This brings up a major inconsistency. The Ministry of Agriculture is proposing a very expensive new plan that is meant to alleviate stress on residential communities, but the Israeli government is also refusing to license new hunters. Licensing hunters would directly reduce the harassment from wild boar on agricultural and residential areas, as Sameer described, but soon these hunters will not be permitted to practice their hobby. In two separate issues, the traditional activities of the Arab Christian community are being averted by the Israeli government. The motive for change in one happens to be a collateral sacrifice in the other. That institutional hypocrisy in the regulation of the pork industry is one of many symptoms that has arisen in the governance of a “Jewish and democratic” state and the damage is disproportionately felt by the marginalized Palestinian Arab minority. In light of this quagmire that is the pork industry of Israel, the Ministry of Agriculture should reconsider its proposal. NIS 300 million is a lot of money; why not designate some of those funds for a government subsidy of this sector of the economy. Israel, as a beacon of democracy, should be cherishing diversity and protecting the rights of its minorities, not stifling their livelihoods. Though there is not much demand for pork products in Israel, an investment in better infrastructure for these pig farms could both bring them up to EU regulations, protect consumers of all religions and ethnicities, and reinforce Israel’s protection of universally acknowledged human rights. Racial profiling on Tel Aviv beaches: A shared U.S.-Israeli value? This article originally appeared at +972 Magazine on 8/7/2012. You can see it at its original domain here. Politicians take every opportunity to tell us that the United States and Israel share values. It is those common ideals that bind us together in a “special relationship.” Rarely do they get specific about what those values are. Recent immigration reform laws passed in the United States and a discriminatory new regulation violating the rights of the Arab Palestinian minority in Israel together elucidate one shared value: suspicion. On April 23, 2010 Governor Jan Brewer of Arizona signed a package of new immigration reforms, S.B. 1070, into law. This law was the manifestation of a new strategy for stemming the tide of illegal immigration. Each provision of S.B. 1070 was intended to establish a policy of “attrition by enforcement,” designed to make illegal immigrants want to give up and go back home. U.S. federal law requires aliens age 14 and older to register with the government if in the United States longer than 30 days, and to have registration documents in their possession at all times. Of all the provisions of S.B. 1070, the Supreme Court reviewed four. Those provisions stated the following: it made it a state misdemeanor in Arizona for any alien to not carry their required documents; it allowed police officers to arrest a person without a warrant if the officer suspected they committed a crime worthy of deportation; it made it a criminal act for an immigrant to apply for or hold a job without immigration papers; and it allows officers to check the immigration status of detained persons if they suspect they are in the country illegally. So it goes. “Reasonable suspicion” now joins “pursuit of happiness” and “freedom” in the pantheon of American values. In a far less publicized affair, Israel recently changed regulations for beach inspectors in a manner that mimics the Arizona immigration law. 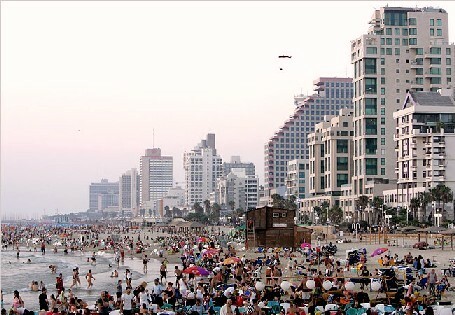 An article in Haaretz from August 5, 2012 describes a scene on Jerusalem Beach in Tel Aviv recently. The author, Roy Arad, was relaxing and enjoying the good weather when he saw a pair of beach inspectors asking a group of men for their identification cards. Arad was surprised, because these officials were formerly tasked only with the management of litter levels and the intimidation of scallywags. What Arad witnessed was the beach inspectors new responsibilities, which now include keeping an eye out for “suspicious characters” and turning them in to the police. It is important to note that the beach inspectors cannot make arrests, but only stop and demand ID from anyone they suspect is in the country illegally. Most of Israel’s famously beautiful public beaches are free to enjoy for everybody. But this new regulation authorizing beach inspectors to act as immigration agents makes the environment is much less hospitable. Any Palestinian citizen of Israel, along with asylum seekers from Africa, can be profiled by these untrained beach inspectors. This can lead to harassment for mere suspicion that the beachgoer is a Palestinian from the West Bank in Israel illegally, without a special permit.. The beach may be free and beautiful, but if constant haranguing from people who until recently were only responsible for picking up trash gets too irritating, they could also become ethnically homogenous. Only those who do not look like undocumented immigrants will be able to enjoy the sun and the surf without fear of government interference. Every citizen of Israel (though we mustn’t forget that even non-citizen Palestinians who are targeted on the beaches are natives to this land) should have the right to walk free of constant suspicion, just as America should be the land willing to take in “your huddled masses, yearning to break free.” In the case of the beaches of Tel Aviv, this is another case of discrimination against the Palestinian Arab minority in Israel, and it must stop.